I have this constant curiosity. Maybe you have it too. I always wonder if there's something more to know, more to learn, more to experience... and more to enjoy. And once I start down that path of wondering, I can't stop until I find out what that next level is, how I can get there, and how I can get you there to join me. That insatiable wondering is what led me from the life of poverty and lack I was living more than 30 years ago to the Law of Attraction... and years later, from that to the even more remarkable Law of Creation. My most recent understandings have broken new ground for me. I realized my newest thinking was creating wonderful things for me that I didn't consciously ask for... things I had never even conceived of wanting... but things that were SO MUCH BETTER than anything I could have imagined on my own. "Inspiration" is a word that gets thrown around so much these days, it's lost some of its power. But it's an incredibly important concept. Here's a definition that deeply resonates with me: "A divine influence or action on a person believed to qualify him or her to receive and communicate sacred revelation." Divine influence... sacred revelation... pretty magical, don't you think? Also pretty rare. But what if it didn't have to be? Now you can, too. 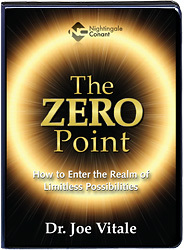 Because I've compiled all of the advanced, master-level clearing methods that got me here, and the step-by-step instructions for applying them in YOUR life, in my new program, The Zero Point: How to Enter the Realm of Limitless Possibilities. P.S. I'm thrilled about every single minute of The Zero Point program. But I especially love the bonus CD. When you're sleeping or in a state of deep relaxation, your mind is so much more receptive to the power of these techniques. It's really going to help you get to that level of "autopilot clearing" I mentioned above. Order The Zero Point risk-free today and try it — and all the rest of these limit-shattering, life-changing techniques — for yourself! A RISK-FREE 30-day money-back guarantee! Yes! I want to reach the Zero Point and receive everything. 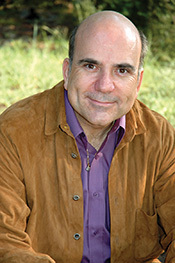 Please send me Dr. Joe Vitale’s NEW program The Zero Point — including the 6 CDs, Bonus Relaxation and Sleeping CD, and Writable PDF Workbook - for the LIMITED TIME OFFER of just $79.95 - which is $20 OFF the regular program price.